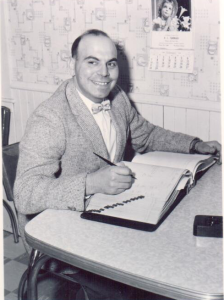 History – VL Tammaro Oil Co.
Vincent L. Tammaro, 85, passed away Friday, Aug. 9, 2013, at Calais Regional Hospital, nine days short of his 86th birthday. Vince was born Aug. 19, 1927, in St. Stephen, N.B., Canada, son of the late James and Philomena (D’Ambrosia) Tammaro. After graduating from Woodland High School, class of 1945, Vince enlisted in the U.S. Army serving in Korea. Upon his completion of military service, he returned home to Woodland and became employed at St. Croix Paper Company where his father and three older brothers worked. This is where the older men at the mill kept telling him to “go away to school and take up a trade.” Once his father became ill, the medicine he required needed to be refrigerated. The refrigerator broke down and Vince could not find a repairman on the weekend. He decided the old men in the mill were right and since there were no schools at the time in Maine that offered refrigeration he moved to Hartford, Conn., where he lived with his sister and brother-in-law, and attended the Connecticut Technical Institute and worked part time for the F.J. Massa Oil Co., driving fuel truck, installing and servicing oil heating equipment. ars has allowed the oil company to expand and diversify to include housing developments, a propane gas company, and a transportation company whose baby blue trucks can be seen throughout Northern Maine. 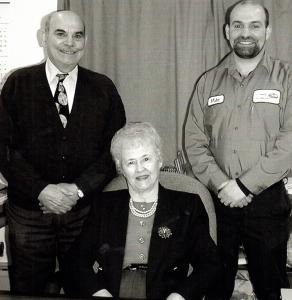 Vincent built his business from 1955 when it was just him and his wife and later a wonderful, faithful, lifelong employee, Gary Croman, to what it is today, still a family owned heating oil, propane, petroleum transport, and service business employing over 30 people and serving the families and businesses in Eastern Washington County. In what little spare time Vincent had, he enjoyed snowmobiling, riding his 1937 Plymouth sedan in parades and car shows, meeting people while traveling the world on business trips and conventions with his wife Betty, or just relaxing with friends and family at his cottage or on his pontoon boat on Pleasant Lake in Alexander. Vince was a Communicant of St. James the Greater R.C. Church, Baileyville, was a member of Woodland Rotary Club, W.T. Wren Post No. 23 American Legion, and a 50 year member of the Maine Energy Marketers Association where he served and was respected as a guy that said what was on his mind always. In addition to his parents, Vincent was predeceased by his loving wife, Betty, in 2012; his siblings, Lena Veneziano, Felix Tammaro, Tony Tammaro, Bert Tammaro, Marjorie Amodio and Genevieve “Gina” Goodwill. Surviving are his three children, John Tammaro and his wife, Louise, of Falmouth, Mike Tammaro and his fiancee, Pauline Beach, of Alexander, and Judith Tammaro of Portland; his granddaughter, Megan Tammaro of Famouth; Vince’s only surviving sibling, Julia “Judy” Pricone; many wonderful nieces including, Dorothy “Dottie” Cervone, Jane Bartram and Barbara Fournier; nephews, Peter Tammaro and Jimmy Tammaro; as wel as many more family members out of state; his loving and devoted caregivers, Freda McIver, Nicole Marritt, Maxine Cropley, and Diane Brown; and his heartbroken “extended family” at the V.L. Tammaro Oil Co. Inc.